Members of the Editors' Council told a news conference in the nation's capital, Dhaka, that they were not pleased that the bill was made a law despite their objections. 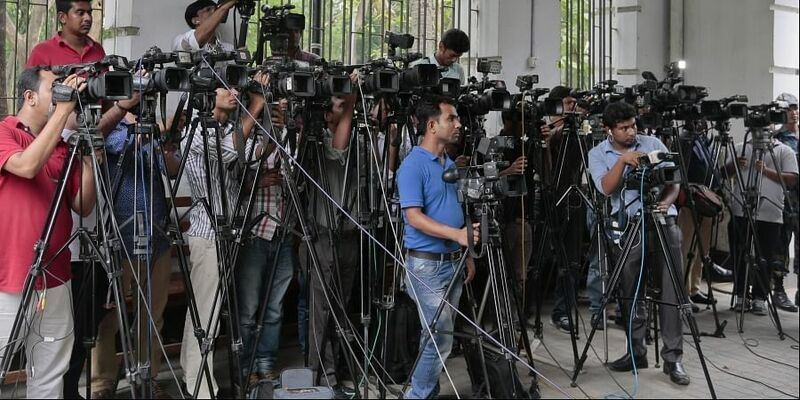 DHAKA: An influential body of newspaper editors in Bangladesh on Saturday criticized the government for a new digital security law that they say will stifle constitutionally protected freedom of speech and curtail press freedom. President Abdul Hamid approved the bill, known as the Digital Security Act, despite promises by three Cabinet ministers and an adviser to Prime Minister Sheikh Hasina that they would address the journalists' concerns about some disputed provisions. Shyamal Dutt, editor of the Bhorer Kagoj daily, said protesters would form a human chain in Dhaka on Monday to demand changes to the law. The Editors' Council had postponed a street protest last month after the country's information minister said officials would look into the journalists' concerns. "There is a Parliament session soon. We hope they will keep their promises and change some provisions," Dutt said at Saturday's news conference. "Our points are very clear, but they did not keep their promises." Talking to The Associated Press after the news conference, Dutt said that the council was not against any cyber security law, but that keeping any ambiguities in the law that would hurt press freedom is not acceptable. "We will continue to protest," he said. Observers say the law is part of a broader campaign to silence critics in Bangladesh, and reflects a worrying trend in fledgling Asian democracies. Such laws in Nepal and now in Bangladesh, where democracy was restored in 1990 after a military dictator was ousted, could make it more difficult for journalists to expose corruption. Bangladeshi journalists are taking particular umbrage with a section of the law that authorizes up to 14 years in prison for gathering, sending or preserving classified information of any government using a computer or other digital device. The journalists say publishing such information is a way to hold officials accountable. The section evokes the sentiment of a British colonial-era law about protecting official secrets. The law also authorizes prison sentences of up to three years for publishing information that is "aggressive or frightening" and up to 10 years for posting information that "ruins communal harmony or creates instability or disorder or disturbs or is about to disturb the law and order situation." Prime Minister Hasina has defended the law, saying it was meant to protect the country from propaganda and misinformation. "Journalism is surely not for increasing conflict, or for tarnishing the image of the country," she said earlier.